Upon reviewing the Gear Fit 2 at the beginning of 2017, we said it redefined what buyers should expect at its price point (then less than Rs. 12,000). It handily beat every Fitbit offering, and was especially suited to those with Samsung phones. We did have a few complaints, and in the months since then, Samsung has fixed one big one. 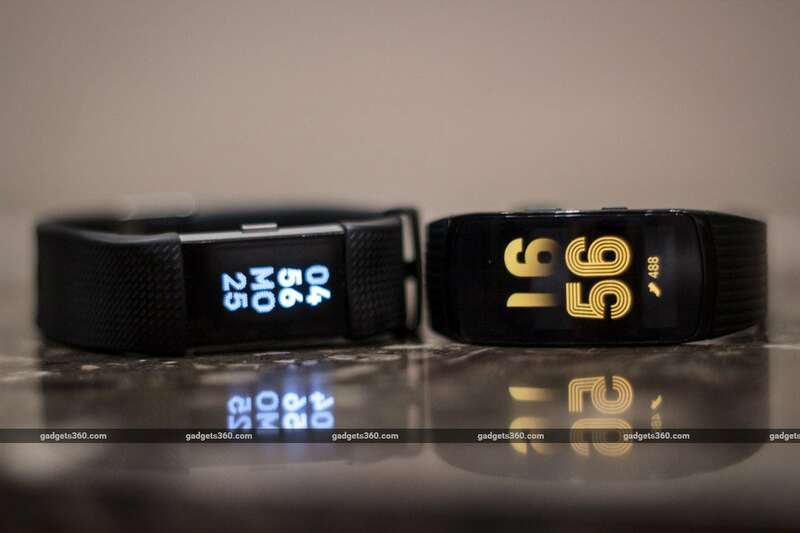 The new Gear Fit 2 Pro is similar to its direct predecessor in most ways. The addition of the ‘Pro’ suffix is because of its more fitness-focused features, including waterproofing – you can easily take this new wearable into the shower, pool, or ocean (up to 50m deep) without worry. There’s also continuous heart rate tracking now, so the device will always keep an eye on how you’re doing. This is Samsung’s third take on a complete fitness wearable, and it shows in its construction quality, ease of use, and feature list. Now that the Gear Fit 2 has been discontinued, this is the one to consider. Samsung has opted for a traditional railroad strap with the Gear Fit 2 Pro, which will be familiar to most people. Inserting the strap’s tooth into the last hole isn’t as easy it was on the Gear Fit 2, but the quality of material used here is definitely better. The Gear Fit 2’s rubber strap left rashes on our arm on days with a lot heavy walking, but that hasn’t been the case with this new model. 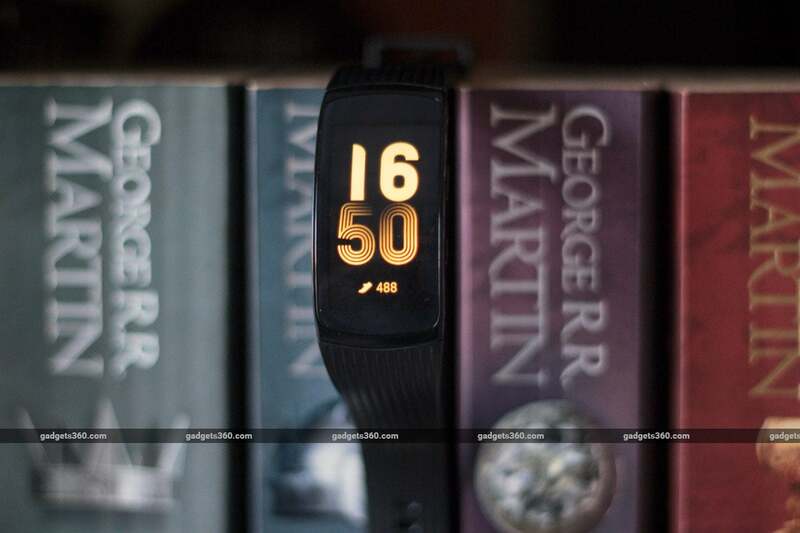 The display on the Gear Fit 2 Pro is the same as before; a 1.5-inch Super AMOLED curved screen that can show all colours, and works with the slightest of touches. In contrast, those on Fitbit devices usually require harder presses. The two buttons – Back, and Home – are still on the right side of the wearable. You can wake up the Gear Fit Pro with a press of either button, or just tilt your wrist so that the display faces you. Samsung has improved the customisation options for watch faces on the Gear Fit 2 Pro. You can tweak not only what statistics you want displayed on the home screen, but also the colour and font. That helps personalise the device, and there are also hundreds more watch faces available via the Gear Store. 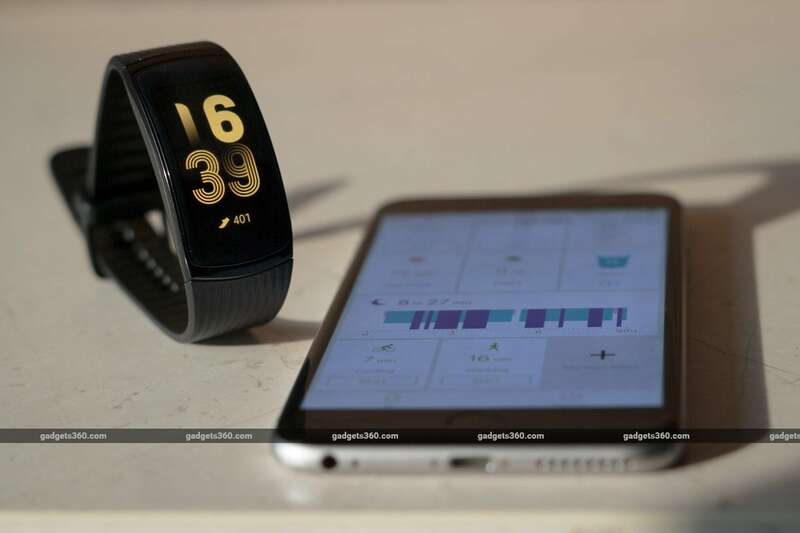 Speaking of the Gear Store, Samsung has (thankfully) gotten rid of the strange forced localisation that we were treated to when we reviewed the Gear Fit 2, so you won’t have to deal with a Hindi interface just because you’re browsing from India. We still couldn’t find a way to change it, but defaulting to English is a better choice in our opinion. The store is still region locked though, which means the likes of Spotify and UA Record aren’t available without the help of a VPN, removing the SIM card, and all that jazz. 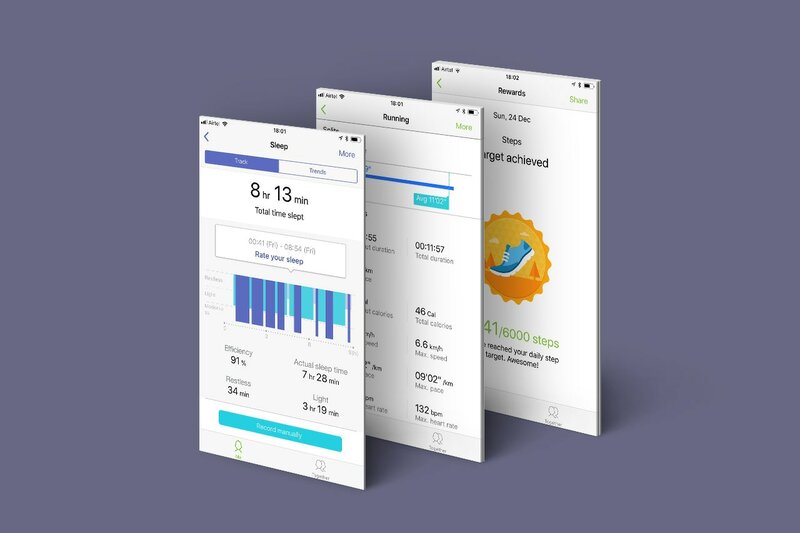 Still, there are many more useful apps now, with the focus clearly on exercising: Under Armour Record, MapMyRun, MyFitnessPal, and Endomondo are the highlights of the lot. The biggest annoyance with the iOS app is that it takes forever to connect to the Gear Fit 2 Pro. For what it’s worth, you don’t need to use the app much unless you regularly wish to install and test new apps, but it can be frustrating when you need to tweak something on the go. Even when it does connect, it can end up randomly disconnecting if you move your hand even slightly. Installing apps is cumbersome for no reason at all. The Gear Fit app throws up multiple dialog boxes before every download, asking whether you want to download directly to the device (the Gear Fit 2 Pro has Wi-Fi as before), informing you that downloads over 1MB can result in high mobile data charges (even if your phone is connected to Wi-Fi), and then a permissions screen. On top of all that, installation takes too long, and apps in the queue don’t download if the phone’s screen goes off. Like its predecessor, the Gear Fit 2 Pro is capable of tracking a wide variety of activities. That includes walking, cycling, squats, and yoga, as well as using exercise bikes and rowing machines. The one big addition this time is swimming. That’s made possible thanks to full waterproofing on Samsung’s new wearable, as opposed to just splash-proofing on the older Gear Fit 2. The device can track these activities automatically, but you won’t get a GPS route of your exercise unless you trigger it manually. Getting a GPS lock takes a long time on the Gear Fit 2 Pro with an iPhone, more so if there are a lot of trees or skyscrapers on the route you normally use. It can mean losing the first one to two minutes of your activity, and in some cases, the device might even give up and ask you to move into an open space to try again. With Android, it’s a lot better as Samsung can pull A-GPS data from your paired phone. But hey, the fact that built-in GPS is an option means that you can leave behind your bulky phone, and not have to deal with arm straps during workouts. The Bluetooth functionality and 4GB of onboard storage let you carry music with you and use wireless headphones. There’s a caveat to that storage figure though – of the 4GB, 1.9GB is already occupied by the system itself, so you start off with 2.1GB. Still, that’s enough space for nearly 300 songs encoded at 320kbps, with an average length of 3 minutes. You can use Wi-Fi to transfer music via the Gear Music Manager app, and you can even use it to maintain a remote connection with your phone beyond the capability of Bluetooth. That way, you’ll know when you’re getting a call (and other notifications) even if your phone is silent and in some corner of the house, as long as you’re wearing the Gear Fit 2 Pro of course. Notifications support is wider than with most Fitbits, and alerts from every app – on both Android and iOS – will show up on the wearable. On Android, you can turn off what notifications you want from the app, but with iOS, all notifications are on by default and can be blocked the first time they pop up. With Samsung’s own phones, you can send canned replies too. When cycling, the Gear Fit 2 Pro’s GPS problem is more pronounced, since bikes are naturally faster than running. We found that we lost records of the first 40-60 seconds of our exercise routines, unless we were okay waiting for the device to get a lock before starting off. Even worse, doing so affected all our stats, as Samsung considers that time as part of the activity. Samsung’s S Health app hasn’t gotten the facelift it needs, but the amount of data it gives you for your exercises is great. It’s deeper than what the likes of Fitbit and Runkeeper provide, owing to how both those apps generate revenue for their makers. The behemoth that is Samsung has no need to lock your data behind a paywall. Samsung is also trying to keep up with Fitbit’s innovations in the sleep department, giving you a look at light and deep sleep, and how much rest you actually got. In terms of battery life, the Gear Fit 2 Pro lasts two to three days with moderate usage. That’s if you keep Wi-Fi and GPS off through the day, and only rely on Bluetooth to maintain a connection to your phone. For those used to the five days that most Fitbit devices can manage, this means more frequent charges. It only takes a little over an hour to get it from single digits to a full charge, given the 200mAh battery. The Samsung Gear Fit 2 Pro isn’t a game-changer compared to its predecessor, but waterproofing and continuous heart tracking are welcome additions, especially since they come without a price bump. The Pro model has been launched at the same Rs. 13,990 price as Gear Fit 2, and is already down to Rs. 13,590 in retail. Samsung was quite aggressive with the pricing of the original, bringing it down to Rs. 11,990 in a few months, and it eventually hit Rs. 8,990, and we could see the same pattern this time around. Even if that doesn’t happen, Samsung’s latest is already more affordable than the Fitbit Charge 2 (Rs. 14,990, but often discounted). Moreover, the Gear Fit 2 Pro has more features and capabilities than the Charge 2 – built-in GPS, a Super AMOLED display, full notifications support, and now waterproofing – that Samsung would be our first choice even if it winds up costing a little more.